This week, Birding Beijing is brought to you by the letter “M” and the number “2”. “M” because there was a distinctly Mongolian feel to Saturday’s birding, and “2” because I saw two new birds! Spike and I visited Wild Duck Lake (Ma Chang to Yeyahu) again on Saturday. We were buoyed by last week’s hints of Spring and, on the bus to Yanqing, our conversation revolved around the possibility of seeing early migrants – would there be a first Little Ringed Plover, or even an Oriental Plover? A Mongolian Lark or Great Bustard? Or something rarer like a Pallas’s Sandgrouse? As usual, speculation about just what might be was pretty outrageous..! In the end, the reality was much better than I could have reasonably expected with two new birds for me – a single Mongolian Lark (yess!) and 2 White-naped Cranes that were seen cohorting with the local Common Crane flock – whilst the rarest bird must be the all-too-brief probable Lesser White-fronted Goose that was associating with around 3,000 Bean Geese (mostly of the subspecies serrirostris but with a few middendorffii mixed in). The supporting cast included c400 Swan Geese, 2 Hooded Cranes, the first Shoveler and Wigeon of the year, a stunning drake Baikal Teal, 9 Kentish Plovers, a single Grey-headed Lapwing, my first 3 White Wagtails (ssp leucopsis) of the year, 20 Mongolian Gulls (18 of which were migrating west), 10 Black-headed Gulls, c300 Smew, 2 Upland Buzzards, 2 ‘ringtail’ Hen Harriers, 2 Siberian Accentors, 4 Chinese Grey Shrikes and 3 White-cheeked Starlings. The day started at Ma Chang at around 0645 and we were greeted by a big flock of Common Cranes by the side of the track. Amongst them were 2 Hooded Cranes, spotted as they took flight. A good start! Then, just as I had set up my telescope to go through the flocks of wildfowl on the far side of the reservoir, everything took flight. This had to mean one thing – a major raptor. Sure enough, a White-tailed Eagle lumbered low over the reeds and settled on the ice. 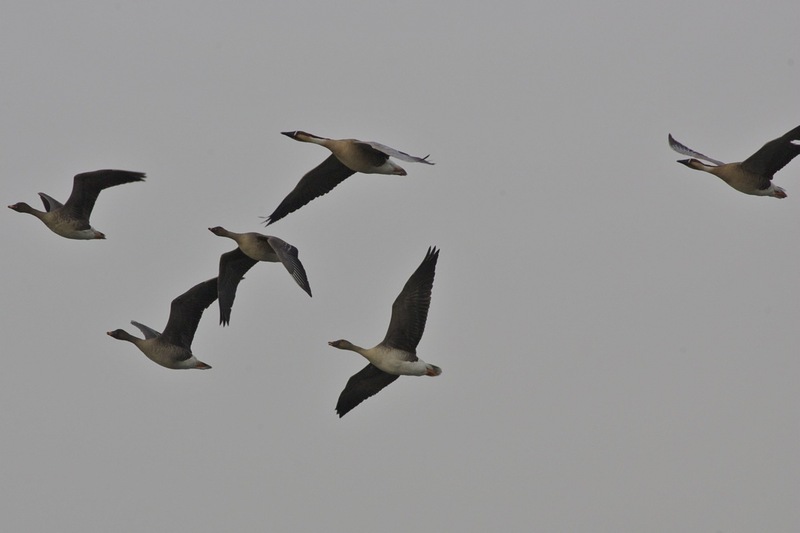 Looking at the sky revealed the sheer scale of the wildfowl present – the sky was full of birds. Bean Geese were everywhere… The sight and sound of the geese in flight shortly after dawn was something to behold. I tried to capture some of the atmosphere on video and you can view a short clip of the Bean Geese here. We just stood and marvelled at the sight for a couple of minutes and then I thought it would probably be a good idea to go through the flocks to see if there were any other geese mixed in. I began to check the flying flocks with my telescope and, in the third flock I checked, I saw a significantly smaller ‘white-fronted’ goose in a flock of serrirostris Bean Geese. I watched it for about 10 seconds in flight before the flock landed on the ice. I could see the relatively small size (at the time, I estimated it was 20 per cent smaller than the serrirostris Bean Geese), dark belly markings, the white base to the bill and I could just make out an eye-ring. I called out “I think I have a Lesser White-front!”. After a scan of the flock on the ground I picked it up at about 200-300m distance, and was again struck by the noticeably smaller size, relatively small head and very peaked forehead. Unfortunately many other serrirostris Bean Geese landed in the same area and several birds walked in front of the LWFG and it was lost to view. I couldn’t get Spike onto the bird… very frustrating! After several minutes of waiting to see if it would reveal itself, we decided to walk to another vantage point to try to view the flock from a different angle. This proved fruitless when the flock flew up to join another flock of Bean Geese heading west and was lost to view. I have seen LWFG in Copenhagen in Spring 2010 (a flock of 50+) and I am confident that the bird was that species, although I would have liked to have studied it for longer to rule out hybrids, taken more notes and, ideally, photographed it.. a little frustrating but hopefully it will hang around and be seen by others. It was shortly after this sighting that we began the walk towards Yeyahu and it was on the shore of the reservoir that we encountered a large flock of larks feeding out in the open. A Kentish Plover called and we soon picked up two, three, then four of these dainty plovers. I set up the telescope to go through the flock with the main aim of counting the KPs (9 in total) when I suddenly got onto a very striking lark mixed in with the Eurasian Skylarks. Slightly larger than the Skylarks and with a black mark at the top of the breast bordered with a rusty wash on the sides of the upper breast, rusty colouration to the median and lesser coverts and a rusty stripe on the head, this could only be one thing – a Mongolian Lark! This is a bird I had hoped to see around Beijing in winter and I was beginning to think my luck was out. To see one in mid- to late March was a nice surprise! After only about a minute it took flight on its own and, with its very distinctive ‘floppy’ flight, it looped over to a more shrubby area and dropped to the ground. Despite a brief search of the area, it never showed again. We walked round to the east side of the reservoir to try to view the flocks of wildfowl that were congregating on the northern shore. Lots of Whooper and Bewick’s Swans, Swan Geese and masses of duck. 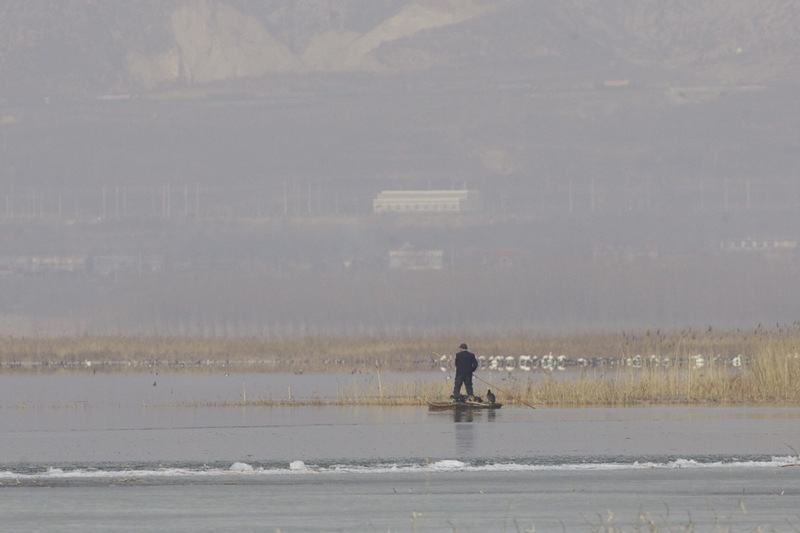 Most surprising of all was the sight of 4 cormorant fishermen who paddled out into the middle of the reservoir and released their cormorants to begin fishing. I thought this practice had all but died out so was surprised to see it being used less than 90 minutes from the capital… (and there wasn’t a tourist in sight!). The onward walk was relatively quiet with just a couple of Upland Buzzards, a few Japanese Quail, 3 Meadow Buntings, 2 Siberian Accentors and lots more Pallas’s Reed Buntings. We were met by our driver at Yeyahu and began the journey home, tired but exhilarated. That first 3 to 4 hours at the reservoir on Saturday morning will stay with me for a long time – fantastic birding. This site has bags of potential in Spring and I can’t wait to return.